And much like the past few weeks, I offer yet another expanded profile. This time, for the last of the programme´s key players: Dan´s twin brother and the main antagonist of Season 1, Rucard. 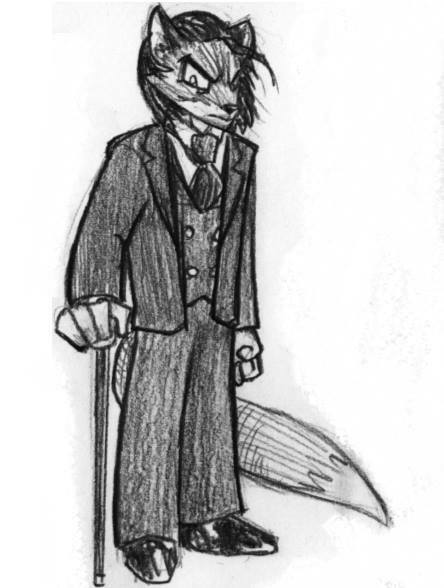 Description: Suave, sophisticated and well dressed, Rucard is Dan's classy, as well as deadly, brother and archnemesis. He is a supremely intelligent and conniving criminal mastermind who is also rather unnerved by his brother’s lack of ‘remembrance’ in Town of Miracles, and decides to set that straight in his own vicious, cruel way. As evidenced also by Town of Miracles, he is a dab hand with technology, a fiercely commanding showman, and utterly ruthless in pursuing whatever his goals may be. Conception: Every worthwhile hero must have an equally worthy villian, and Rucard filled that role out nicely. While Dan is very dynamic, direct and yet still caring, Rucard is more educated, reserved and incredibly manipulative. I wanted him to serve as an inversion of Dan, and when their backstory is revealed later, that becomes all the clearer and more interesting. Furthermore, once their history is revealed and explored, it also allows for the opening up of a new dimension to their relationship, and how they, in the end, ultimately serve as a perfect counterbalance for each other and what they value. Rucard in particular has a very interesting view on his brother, and what their constant duels mean, which should be a lot of fun to explore and contrast as the show evolves.